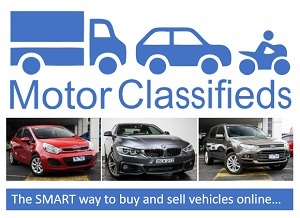 Hyundai outsells Holden. Who would have thought that would ever happen? Hyundai now makes premium vehicles. Who would have thought that would happen? 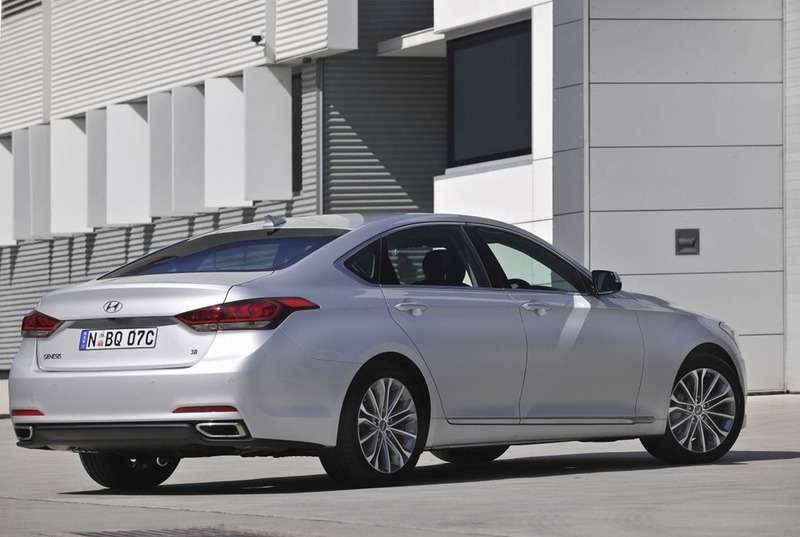 Hyundai, who spent so many years nurturing the “cheap and cheerful” tag, are now so sure of their product that they are gambling on spinning off their “Euro-Killing” Genesis brand like Toyota did with Lexus 30 years ago. Most punters have never heard of Genesis outside of biblical references, but anyone using a Car Service will no doubt have ridden in one without knowing it. From the outside, there is a touch of Audi and Mercedes Benz (from a few years ago). On the inside, there are thoughtful tfeatures worthy of Jaguar and Maserati. I like the analog-style clock with a clean clearly defined centre stack and console. Anyone familiar with a BMW interior might notice more than a passing resemblance to the layout of the centre stack with the LCD, climate controls, and audio controls, even down to the shape of the bezels. It is neat and uncluttered, yet functional with a premium feel. 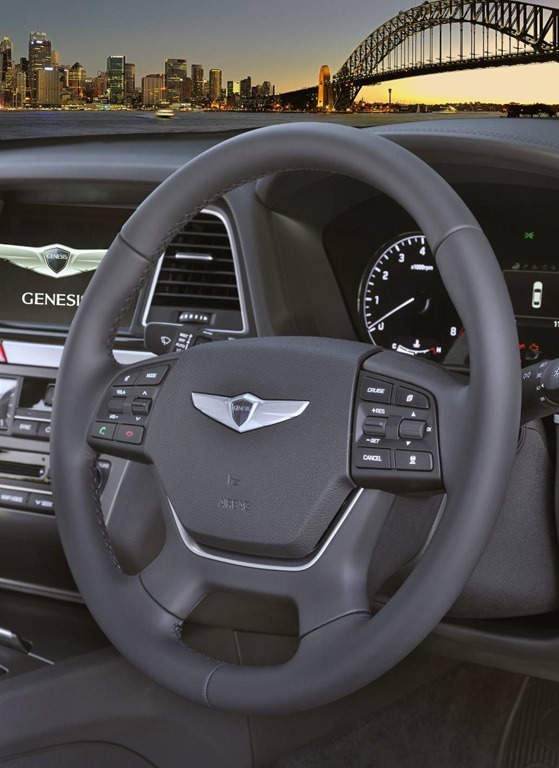 And, is it just me, or does the Genesis badge look like it was nicked off an Aston Martin. If it sounds like I’m comparing the Genesis to the Europeans, I am, and I am doing it favourably. It has big 18” or 19” wheels depending on trim level, and weighs between fairly 1890 and 1995 kg. she is a hedty lassie. The suspension is Multi-link with High Performance Dampers both front and back. That’s a lot of tech for 61 grand. Genesis also has some party tricks. The doors have little motors so you only have to gently close to the fist click, with the motor closing the final 6 mm. Standing behind the boot will cause it to open, or there is a button on the dash if the driver wants to stay in the car. There is lane departure warning, blind spot warning, and cross traffic alert, and the driver has controls for the front passenger seat. 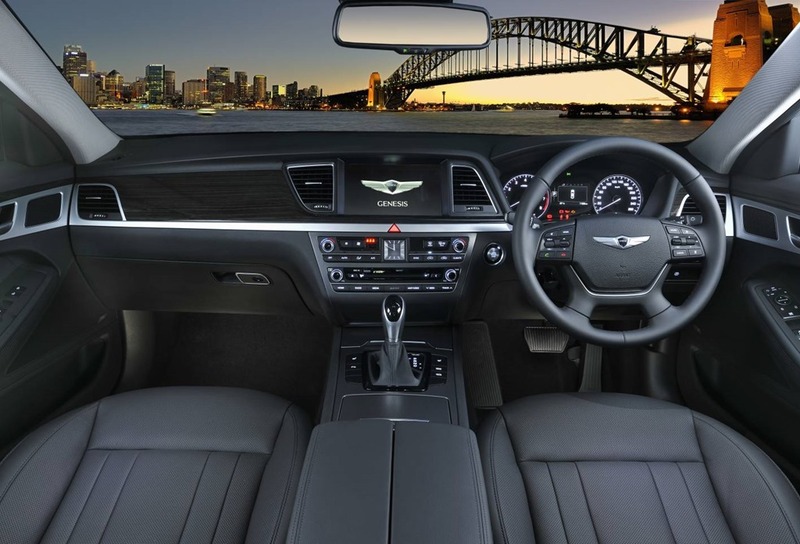 The seats up front are heated and cooled, with a huge 9.2” touch screen topping the centre stack. The 900w Lexicon sound system sounds impressive but does not have Apple CarPlay or DAB. Next year Genesis becomes its own brand and will get a midlife update which should take care of those little niggles. That won’t help buyers now though. I particularly like the HUD which displays the speed and directions on the windscreen. Sure, a lot of cars do that, but very few will also display the Blind Spot Warning as well. Which ever side the obstacle is, will show on that side of the HUD. That is genius. The rear seats are as comfortable as the good ones up front. There are some auxiliary controls for audio front passenger seat, and climate in the centre armrest. Genesis is aimed at the kind of person who like to ride in the back most of the time. The quality of the fixtures and fittings is generally good. My only beef was that the rear door blinds, and sunroof button, felt a bit cheap. Then I remind myself that I could get 2 or 3 of these for the price for the price of a 5 series, A6, or E class. I’m not suggesting for a minute that a Korean car is currently an even swap for a BMW or Jaguar, but you get an awful lot of car for relatively little money. A canny buyer could well spot an opportunity. The elegant looks are matched by equally good manners once you leave the garage. The steering has rack mounted electric assistance with speed variable torque. The slower you go, the more assistance you get. The engine and transmission feel well matched. It will try and change up as quickly as possible to conserve fuel, but doesn’t lend itself well to sporty driving. You’re best off using the paddle shifters to decide when the changes should happen. Although 3.8L is biggish for a V6, it is silky smooth with almost no vibration entering the cabin. The experience had a lot in common with my very first drive of my favourite car ever, the Jaguar Series III. The power is delivered smoothly from 1200rpm with enough torque for a brisk getaway. Nearing 2 tons, you feel like you’re driving limo around town. Things should be taken at a regal pace and you feel the need to wave at passers-by. The cabin is quiet most of the time. Even the coarse tar-chip roads were hardly noticeable. A lot of attention has been paid to all occupants, not just the driver. The audio sounds excellent at any speed and could be turned up to “ear-bleed” without distortion. Genesis feels substantial, a little heavier than I’d like at times. 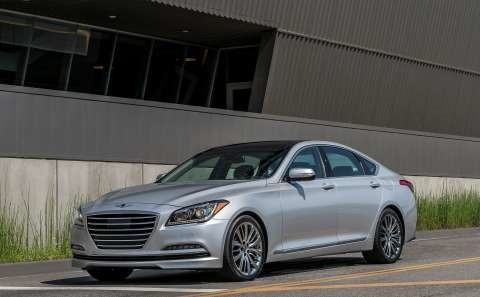 A brand with aspirations like Hyundai has, compared Genesis to the Europeans when doing local tuning, so one supposes they did the same thing when designing it. Despite the substantial weight, Genesis switches direction with little body roll. Through the corners, it remains composed afollowing a once-in-once-out steering philosophy. Bumps hit on the way through are barely noticed and cause no drama. Fuel consumption rises alarmingly with a heavy foot. Spirited driving sees the economy rise to over 20L/100k in city driving. This is still considerably better than a big European. The electric rear blind can be raised from the driver’s seat, or the rear passenger armrest. It retracts while reversing, and there are manual shades on the rear doors. The rear compartment feels shielded from the outside world which is usually the way VIPs like it. You get a lot of car for your money. Hyundai shook up entry level segment, and looks set to do the same thing to premium market. Ignoring the Koreans would be a mistake because the quality and value can’t be beat. Their cars now drive like they look and come fully loaded with mod-cons galore. It is handsome and fleet of foot. It is spacious and well designed, and all for a fairly reasonable sum relatively speaking. I wasn’t sure what to expect from a Large Korean car. Like large French cars, they might be hard to sell, but unlike large French cars, you don’t need to sell you first born to buy one. Nor will you watch the resale value tick down like a egg timer! Insufficient time has passed to fully evaluate the longevity of the model, and the fact that sales of about 50/50 for fleet and private buyers may or may not bode well for it. For anyone wanting a factory standard premium grand tourer, you could do worse. You would have no trouble doing a thousand k’s without turning a hair. This is a great effort and provided buyers can get over their badge envy, Genesis will do well.